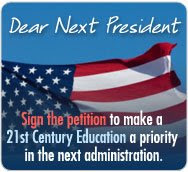 CoSN and ISTE have teamed with the National Education Association and the State Educational Technology Directors Association to initiate a PETITION, found at http://www.onegiantleapforkids.org/ that offers a collective vision of what a 21st Century Education should include. The Department of Labor reports that out of 55 industries, education is last in its use of technology. By 2010, if current trends continue, more than 90 percent of all scientists and engineers will be living in Asia. Supporting access for all students to technology and the Internet. Increasing federal funding for education technology through the Department of Education’s budget. Preserving the E-Rate and providing robust bandwith in all classrooms to allow students and educators to use the cutting-edge digital applications and services. Incorporating technology literacy and facility into state teacher standards, teacher training, and professional development. Encouraging student technology literacy by the eighth grade. In order to get more technologically savvy to prepare to get back to the education job market, I started a blog http://www.thebookbench.blogspot.com/ I would love your feedback, and I just wanted to say hi. I put up my blog - it's pretty bare bones, I think I'll spend some time on that this weekend. I think the address is hazelsharpe.blogger.com. I will include a link on my website. I also registered at teachade - awesome site, btw. On both sites I use my nom de guerre, Hazel Sharpe. It's my mean librarian name! One of our classmates is using teachade as a place to work on the Webquest project which is great idea and my group may steal it! I responded to the CoSN and ISTE and added my name to the list of teachers that would like to see more technology in the classroom and at the very least the classroom be brought up to 21st century standard. I am so new to blogging that I am slowly evolving into finding ways to use it for educational purposes. I approached my principal with the thought of creating two blog sites for the students. One would be for my math classes - the students would develop a wiki on math topics they learn throughout the year and continue to edit and update the blog page in words that they can understand rather than words, definitions and/or examples found in the textbooks. The other useful area for a blog page would be for the school newspaper - the students could blog information they feel is important for publication in the newspaper - sort of a collection point for all the thoughts and ideas they have for each issue. Whether or not I am approved to do it, at least I am beginning to see the value in using a blog not only for school, but as a new form of communication, information gathering and reporting outside of school.